Vitaly Mansky, producer of a documentary on the rise of Russian leader Vladimir Putin screened Wednesday at the National Press Club, created the film using clips of former Soviet leaders Boris Yeltsin and Mikhail Gorbachev and Putin himself, made before Putin came to power. When Yeltsin appointed Putin, a KGB veteran, to replace him for the last three months of his presidency, Mansky, as director of documentaries in Russia at the time, had easy access to Putin to complete this film. Speaking after the screening, now 20 years after the the events in the film, Mansky said he wants it to  serve as a warning because it demonstrates how Putin’s power was gained and maintained. His initial position was one of curiosity and the desire to investigate, analyze and rationalize the situation, Mansky said. He never imagined that this man, originally thought to be a Western-style reformer, would monopolize power and fill three terms of his own, plus one with Dmitri Medvedev, a Putin insider. In the film, on election night, Dec. 31, 1999,  Yeltsin waits in vain for Putin to return his congratulatory call. 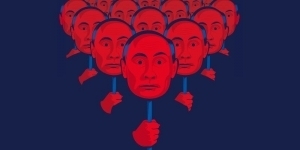 The film shows the removal of Putin’s very liberal supporters within the first half of his first term and their movement to the opposition. The film points out that only Medvedev remains with Putin to this day. A film clip on Putin’s return to the national anthem of Soviet days is an early harbinger of the future, Mansky said. He is seen questioning Putin, who defends this decision by the necessity of nostalgia. A short take shows Mansky’s wife distressed by Yeltin’s boost of Putin and later proudly voting against Putin in the election. Mansky explained in answer to a question that the KGB harmed both her grandparents. Susan Glasser of VOA, Kenan Aliyev, executive editor of Current Time TV, Mansky and his translator participated in the post-screening panel. Club President Allison Fitzgerald Kodjak moderated the discussion. Current Time TV, which presented this film, is a 24/7 Russian-language TV and digital network providing an alternative to Kremlin-controlled news.